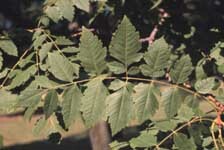 Bright green summer foliage turns yellow in fall. Large yellow flowers are followed by bladder-like, green fruit that changes to yellow and then brown. Suggested uses for this plant include shade and specimen plant. Tolerates wide range of soil conditions. Tolerates drought, heat, wind, and air pollution. Transplants best as a small tree with balled and burlapped roots. If required, prune during the winter. No serious insect or disease pests. 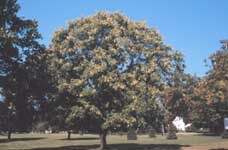 The large, conspicuous, yellow flower clusters are produced in late June when few other trees are in bloom. The bladder-like fruit hangs like clusters of small Chinese lanterns until late in the fall. Recommended for urban conditions. Most effective in informal landscape situations. This material was developed by Carol Ness as part of the Interactive Design and Development Project funded by the Kellogg Foundation. Mary Miller, Project Director. Diane Relf, Content Specialist, Horticulture. Copyright 1989 by VCE.